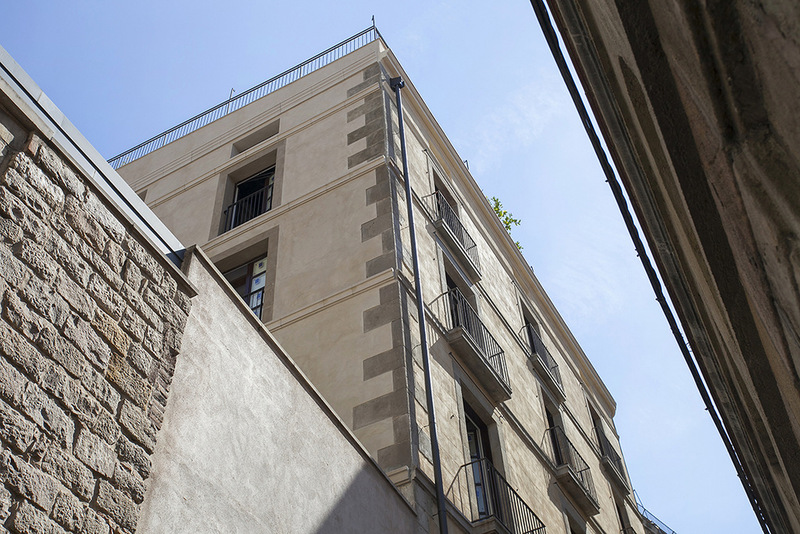 The exquisite renovation of a residential building on the site where Barcelona’s Rabbi lived in Medieval times reminds us of Barcelona’s Jewish heritage. Marlet 1 is a high-end residential renovation of a historic building on a quiet street in the heart of Barcelona’s historic Barrio Gótico, next to the city’s Ancient Synagogue, and just around the corner from the Palau de la Generalitat (office and residence of the President of Catalonia), City Hall, and Barcelona’s Gothic Cathedral. As far as Barcelona’s Gothic Quarter goes, this is a prime location. Barcelona had a vibrant Jewish quarter in Medieval times called “El Call” or “Congregation” in Hebrew, which evolved from the original Roman City into what is now the picturesque Gothic Quarter, and a major tourist attraction. 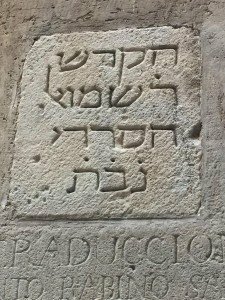 Like elsewhere in Spain, the Jewish community played an important role in Medieval Barcelona, before persecution and eventual expulsion in 1492 drove the Jews out of Spain, taking their human capital with them. Beside the Synagogue, called Sinagoga Major de Barcelona in Catalan, was the house where the Rabbi lived, which then became a shelter for the downtrodden and travellers. The commemorative plaque of 1314 in Hebrew (pictured), dedicated to the rabbi who founded it, is still preserved in the building, which also has Roman ruins in the basement. Around 1880, when Barcelona was prospering from a boom in the textile industry, a handsome building was constructed on the site of the Rabbi’s house, though by the 1990s, when the Gothic quarter went through a rough patchand and used to be intimidating to visit at night, Marlet 1 was standing empty. Better times were around the corner. In the past 10 years this area has become safe and super trendy, (wine bars, coffee shops, craft beer bars, etc.) while maintaining many of the old-time shops selling antiques, jewelry, and art studios, that give the barrio it’s traditional flavour. It’s an intoxicating mix of heritage and modernity, beauty and culture, sunshine and shadow. 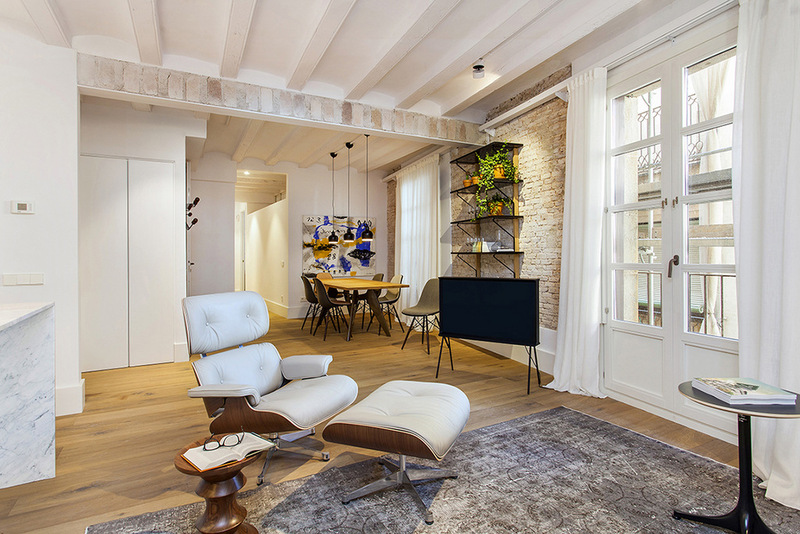 In keeping with the Gothic Quarter’s transformation into one of the most sought-after districts of Barcelona, Marlet 1 is a tasteful redevelopment of an historic building that does justice to the location. Marlet 1 has five floors, with two 2-bedroom lofts on the ground floor, six 2-bedroom apartments on the first three floors, and two 2-bedroom penthouses on the top floor. Apartment sizes range between 115m2 and 126m2, and the whilst the penthouses have a private roof terrace, the other apartments share a roof terrace. Inside, the spacious apartments have been kitted out with stylish, top-end interiors, including oak parquet flooring, intelligent lighting, exposed brick walls, beams painted white, and high-quality joinery, whilst their high ceilings and large French windows with balconies, and the building’s open façade on three sides, ensure abundant natural light – a rarely found feature in Barcelona’s Old Town. The result is a charming blend of historic and modern, combining new technology and stylish design with original early 19th Century features. Marlet 1’s history is likely to appeal to Jewish investors looking at prime Barcelona, many of whom will have noticed the city’s compelling investment case. The Spanish Golden Visa scheme, which allows non-EU nationals to get qualified residency permits, Schengen-area access, and a path to Spanish citizenship, in return for investing in Spanish real estate (and other assets), also adds to Marlet 1’s appeal to Jewish buyers from outside the EU (soon to include the UK! ).